These homilies of Saint Isaac the Syrian are on the life of prayer and stillness-hesychasm and have been treasured by monastics and layman alike. The book includes an introduction about the Saint’s life and the manuscripts of the homilies and the various translations of them, with maps, and Appendices with homilies by Saint Isaac only in the Syriac, a Glossary of special terms, and more. 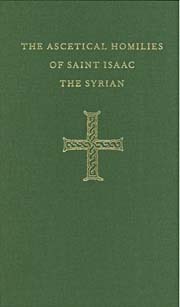 Includes all the homilies by Saint Isaac in the first edition plus two newly translated from the Syriac that were omitted from the first edition.